There is nothing more comforting than Classic Spaghetti and Meatballs, which my grandpa makes every Christmas day. Popsy makes the best meatballs of anyone I know. His father was a Sicilian butcher in New Orleans, so there’s a little of both cultures baked into this recipe. He swears by Tony Chacheres Cajun Seasoning, to the point where I had a bottle of it tucked into my carryon to cook with for Thanksgiving this year. He puts it in everything! The funny thing about his recipes is, he never makes anything the same way twice, and it certainly is never written down. He’s always tweaking and changing things. So to get this recipe, I had to call him several times and write down notes, and special order a can of something (more on that later) for my sauce, which is his great grandmother’s recipe from Sicily. We made these for friends on Halloween and had a meatball party! It was a huge success, and with salad, bread, and good company, this dinner is easily thrown together but a really delicious holiday feast. 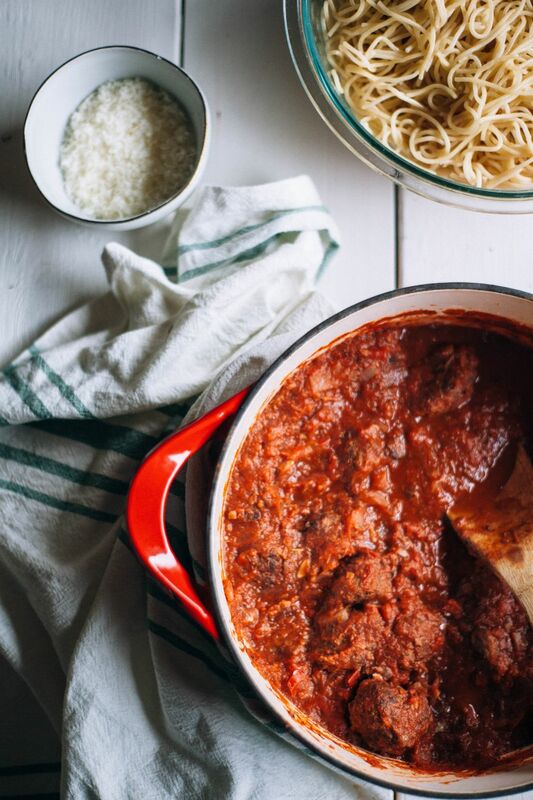 The secret to good meatballs is a mixture of pork and beef, never just beef. Popsy makes these with the whole family every Christmas, and it’s really a joint effort. Sharing recipes with loved ones and cooking with them is such a gift, and that’s definitely Popsy’s gift. Let’s start working on these meatballs! You’ll use your hands–kind of gross, I know, but just dive in. First you’ll mix together the beef and pork with garlic, bread crumbs, parsley, eggs, cajun seasoning, salt, pepper, and oregano. 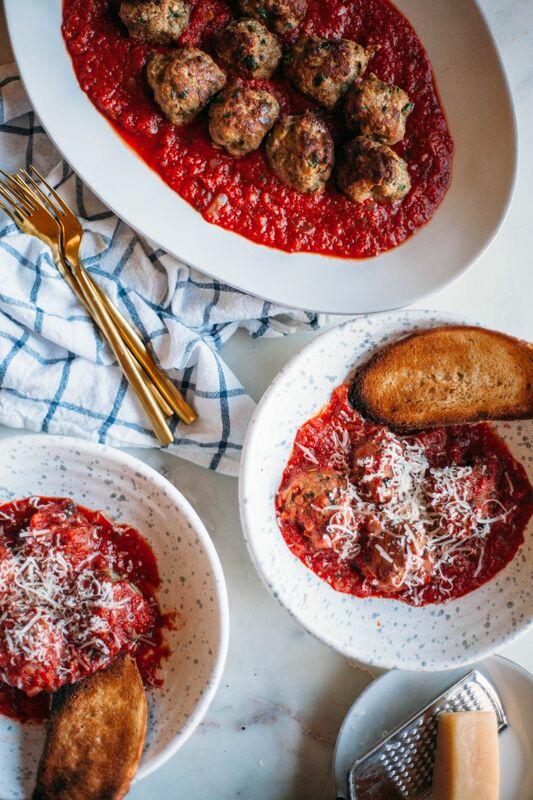 The trick to making the meatballs all the same size is to divide the meat into four parts, then make six meatballs out of each of the parts. It makes the process much more manageable. Just roll them up in your palms to about the size of a golf ball. Popsy just places the meatballs on a baking sheet and puts them in the oven, but I like to sear them first. I like have a bit of a crispiness on the outside, but I leave that up to you! Then bake them for about a half hour or until no pink shows in the center. The sauce is a simple one, but there’s a secret ingredient you have to use. 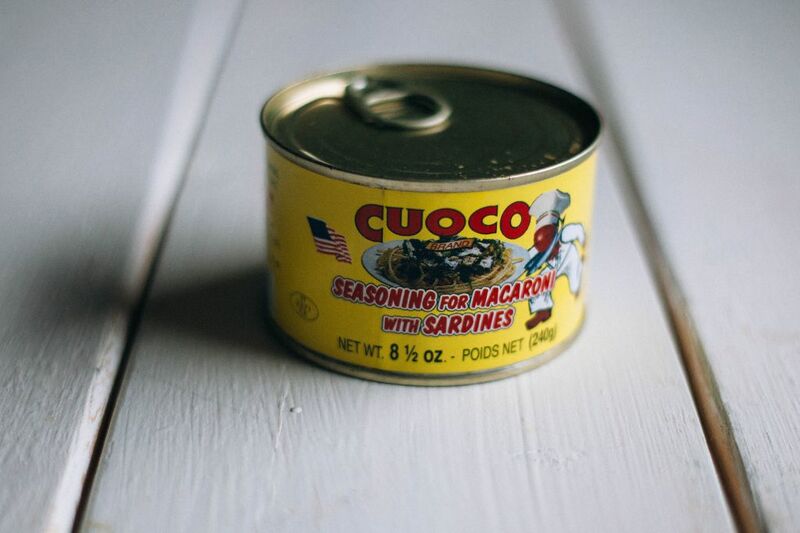 It’s a can of Cuoco Macaroni Seasoning with Sardines. Popsy special orders these cans from his local Italian grocery, but you can find them on Amazon. Now, before you freak out, it’s so so good, and it’s what makes this sauce Sicilian. You will never notice the sardines, since they’re boiled away into the sauce. This stuff has black currants and herbs like fennel leaves. It’s seriously amazing and will take your sauce from okay to incredible. To make the sauce, saute the onion and garlic. Add the oregano and tomatoes, and then the macaroni seasoning. Let it simmer and add the meatballs to warm them up a bit. 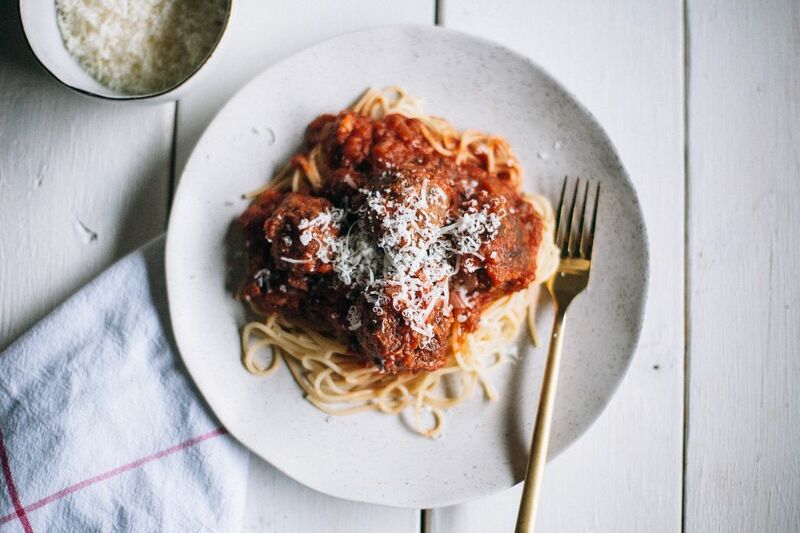 Serve with spaghetti, and you’ll have some very pleased dinner guests. See below for the full recipe. What dishes do you serve on holidays? For the meatballs, in a large mixing bowl, add the pork, beef, breadcrumbs, garlic, parsley, cajun seasoning, oregano, salt, pepper, and eggs. Use your hands to combine all the ingredients very well. Form into a large ball and then divide into four parts. 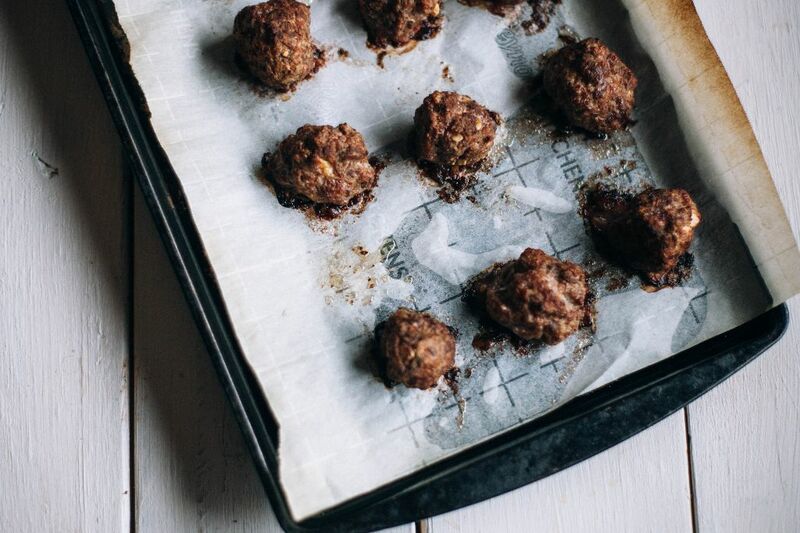 From each part, roll out six meatballs onto a plate. Cover two large baking sheets with parchment paper or drizzle with olive oil. Set aside. In a large nonstick pan over medium high heat, add a drizzle of olive oil. Add the meatballs and sear on a couple sides for one to two minutes on each side until a crust forms. There will be lots of red still, and that’s how it should be. Don’t over cook these in the pan, we just want a couple sides to have a crust. Remove the meatballs from the pan to the prepared baking sheets. Repeat with the remaining twelve meatballs. Place the meatballs in the oven and bake for about 30 minutes. For the sauce: Meanwhile, in a large dutch oven or pot, over medium high heat, add a drizzle of olive oil. Add the onion and garlic, and saute for about 5 minutes or until onion is translucent. Add the oregano and stir, sauteeing for one minute more. Add all the crushed tomatoes with a little salt and pepper and bring to a boil. Add the macaroni seasoning and stir. Bring down to a simmer until the meatballs are ready. Add the meatballs to the sauce. Cook your pasta to package directions. Serve on spaghetti.